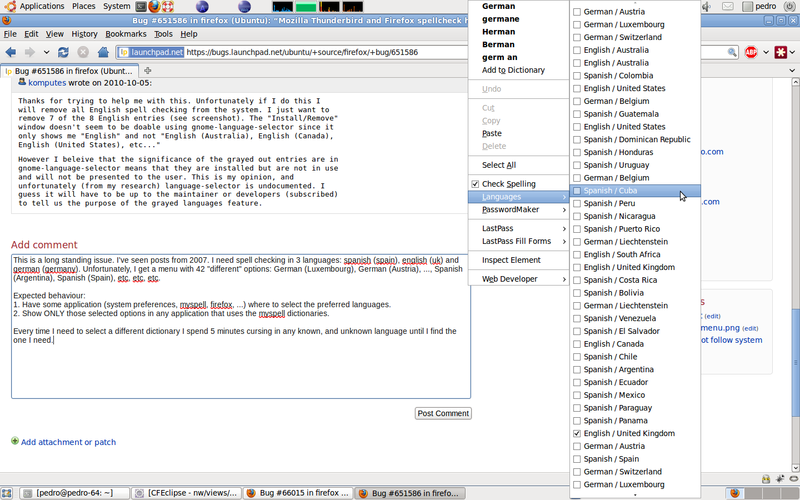 Mozilla Thunderbird and Firefox spellcheck has too many languages. 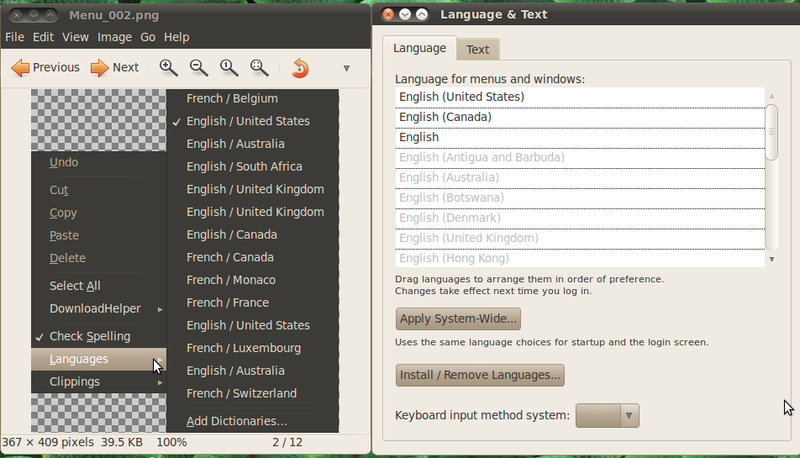 It does not follow the Ubuntu Language Support Standard (gnome-language-selector). Language Support (gnome-language-selector) has a feature which allows you to gray out languages you are not interested in seeing and black in the languages you would like to see. Mozilla apps should follow this or should at least offer a workaround allowing a user to disable certain languages. Firefox and Thunderbird both offer the dictionaries installed on the system (which I believe is correct). It's not really obvious what the significance of the greyed out entries are in gnome-language-selector. As another example, if you open gedit and go to Tools -> Set Language, it will present you with the same list of dictionaries installed on the system (just like Firefox, but in a dialog rather than a menu). Thanks for trying to help me with this. Unfortunately if I do this I will remove all English spell checking from the system. I just want to remove 7 of the 8 English entries (see screenshot). The "Install/Remove" window doesn't seem to be doable using gnome-language-selector since it only shows me "English" and not "English (Australia), English (Canada), English (United States), etc..."
However I beleive that the significance of the grayed out entries are in gnome-language-selector means that they are installed but are not in use and will not be presented to the user. This is my opinion, and unfortunately (from my research) language-selector is undocumented. I guess it will have to be up to the maintainer or developers (subscribed) to tell us the purpose of the grayed languages feature. This is a long standing issue. I've seen posts from 2007. I need spell checking in 3 languages: spanish (spain), english (uk) and german (germany). Unfortunately, I get a menu with 42 "different" options: German (Luxembourg), German (Austria), ..., Spanish (Argentina), Spanish (Spain), etc, etc, etc. 1. 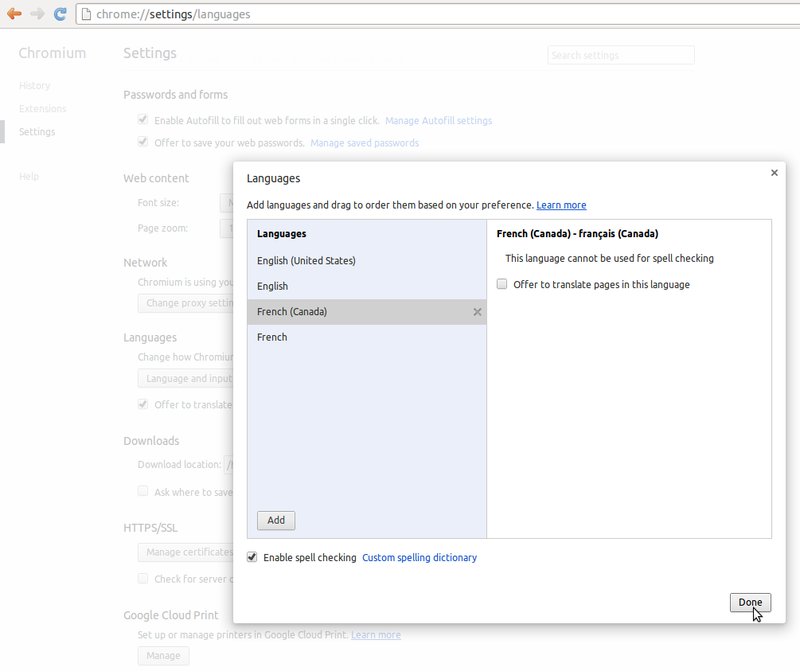 Have some application (system preferences, myspell, firefox, ...) where to select the preferred languages. 2. Show ONLY those selected options in any application that uses the myspell dictionaries. Every time I need to select a different dictionary I spend 5 minutes cursing in any known, and unknown language until I find the one I need... please help! Firefox seems to detect different spell checkers now. I can add Afrikaans to firefox, but it doesn't appear in the hunspell list. The same goes for en-za. Can someone shed some light of the various methods FF can use (version 3.6 upwards it seems)? Maybe we can find a workaround in the meantime? If you type e-mails in 4 differente languages, and you have to switch among these 4 dozens of times a day, you will understand how horrible it is to have 30 options rather than 4 every single time you want to switch. There is even a rolling bar! If one of these languages is spanish, it gets worse. This bug is still in Ubuntu 11.04 with Mozilla Firefox 4.01. According to https://bugzilla.mozilla.org/show_bug.cgi?id=631516 , it's an Ubuntu bug, not a Mozilla one. As regards language-selector, its behavior is documented in Natty. You can reach the help document, which e.g. explains the meaning of the greyed menu items in the combobox on the "Language" tab, by clicking the "Help" button when in Language Support. Furthermore, this is reasonably not a language-selector bug, at least not in Natty, where the list of display languages consists of available translations. I invalidated the language-selector bug. The use of the word "dictionary" confuses me. The long lists seem to consist of locales, not dictionaries. Maybe there is just one dictionary for Spanish spell checking, for instance. Thunderbird and gedit still show all available locales that relate to the installed languages, which does not make sense IMO. It seems we actually can do something about this in check-language-support by not installing e. g. the -en-za dictionary if the user only selected e. g. "English (UK) / English" in the language preference list. With the static language-support-LL packages gone, it should actually be feasible to make this more dynamic now. I do not know how to classify as duplicates. I should only have GB and ES spain. What GB do you suggest removing? is CA spanish? what is za? I have the same problem. Too many types of English and Dutch show up in Thunderbirds spelling checker. Renaming(/backupping) the obsolete .aff and .dic files in /usr/share/hunspell fixed the problem for me. Official support for the desktop version of Ubuntu 10.04 LTS "Lucid Lynx" ended on May 9, 2013. Official support for Ubuntu 11.04 "Natty Narwhal" ended on October 28, 2012. Is this still occurring in Ubuntu 13.04 "Raring Ringtail" with Firefox 23? madbiologist, yes this still occurs on Ubuntu 13.04 with Firefox 23. I have a laptop with the English and Dutch languages installed and the default available spell checking languages in Firefox are 6 versions of Dutch (Dutch Belgium, Dutch Antilles, Dutch Suriname, Dutch Aruba, Dutch Dutch and Dutch while I only need one version of Dutch and 4 versions of English (English UK, English USA, English South Africa, English Australia) while I only want the UK and USA versions. 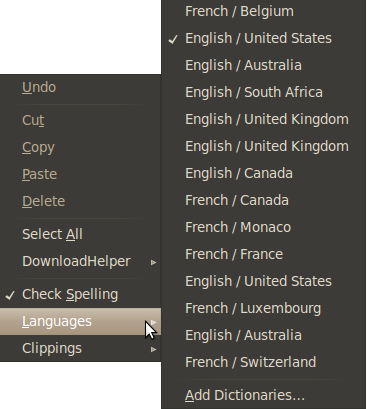 Note that I specified these preferences in Ubuntu's language settings (though these settings show a different selection of language varieties, e.g. only 1 Dutch version and no English South Africa, but does list English Canada and English New Zealand). So, is this bug ever going to be fixed? I really hope so. Spell check in default mozilla applications is bulky and needs to simplified. Is it possibly the same as #1066720? Is there any way we the users can help to trace back the bug? This is not related to bug #1066720. My answer at http://askubuntu.com/questions/545356 might help illustrate the nature of the issue reported in this bug report. My point: It is difficult or even impossible for people to add a new spellcheck in Chromium. 2. Revival it for using it more. 3. Have enough articles to generate statistics, or have an organization to check every text produced and justified about the spelling / orthography. I read from Wikipedia and Evertype.com that Ireland that nearly a hundred years to revival the written Irish Gaelics. And now, the aboriginal Taiwanese started to have textbook in their own around ten years ago. It is about the time the first generation of kids educated in their aboriginal language are capable to analyse their native tongue. I see studies of their languages as well as language tools emerging. Adding libreoffice and libreoffice-dictionaries as affected packages. Basically, if I understand it correctly, the symlinks, which cause all the items in e.g. Firefox and Thunderbird, are there to ensure that the dictionaries are properly recognized by LibreOffice irrespective of the language/country combination in the effective system locale. So if it would be doable to change the LibreOffice behavior in this respect, we could get rid of many of the items in the spellcheck lists of other applications. We just had another package that likes and wants more symlinks, and I'm going to approve that and add more symlinks. I don't think removing them is the way to go atm, rather firefox and thunderbird could do something to deduplicate them (but it needs to be clever, as not necessarily all en_* (or whatever) are the same).